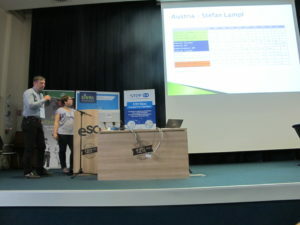 Another of our conferences is past, and allowed us to meet, talk and learn. We shared great moments of gathering together and listened to a huge lot of interesting presentations. In total, 195 people from 16 countries came the more or less long way to Angers (France) for our favorite little berry: the blackcurrant. The 6th International Blackcurrant Conference started on 6th June, with a visit of the New Holland plant in Coex. The participants could see where and how their Braud harvesters (or tractors) are being produced. They enjoyed a very warm welcome by the marketing and commercial staff. A one-hours visit led through the different parts of the factory. Everything starts by huge metal sheets: the workers and most precise machinery cut them, bring them into the right shape, before they go to the welding area. From there, they go through painting tunnels and come out in yellow and blue colors. Final steps: assembling all the pieces of the machine and checking the finished product. An amazing and most impressive visit! 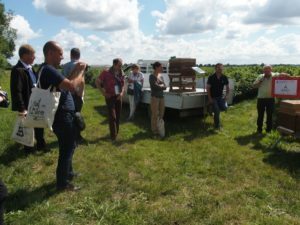 On their way back to Angers, the participants went to see a blackcurrant farm in Lirè. 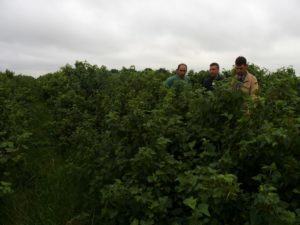 It is always a great moment for blackcurrant growers to see how others get along. Seeing different varieties, getting aware of similar or totally different problems with the crop and sharing experiences. This is what the participants appreciate and await from every conference. Blackdown, Noir de Bourgogne, Andorine, Andega and Royal de Naples are the varieties that only French growers plant. This is a special need for the producers of the famous French Créme de Cassis (blackcurrant liqueur). 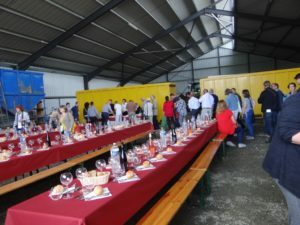 The day ended at the conference venue, the Ecole Superieure d’Agriculture (Higher School for Agriculture) of Angers, with a picnic dinner. The following presentations focused on technical and economical challenges in blackcurrant growing. 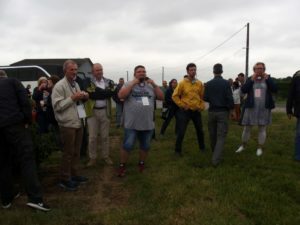 At the end of this morning session, another farm visit led the delegates to “Les Rosiers sur Loire”. There, they enjoyed the Ludeau-family’s hospitality and expertise. The Ludeau’s exemplar farm gave place, of course, to field visits – but also much more. Several exhibitors could present their know-how in weed-control or pollination. The delegates could see the dedicated machines and get precise explanations. It was a lovely summer day, which ended up with a relaxing boat ride on the Maine-river. Finally came the delicious gala dinner (where every dish contained blackcurrants in different forms) in a spectacular reception hall in Angers. 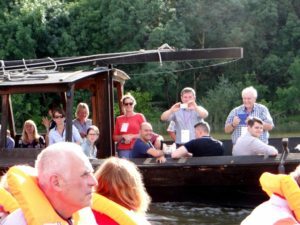 The last day of the conference went in the direction of marketing, health and promotion. It was consumer-orientated and attracted several blackcurrant transforming companies. They could listen to 16 experts in different fields of application. But blackcurrant was always the center of interest. If you couldn’t be with us, remember that we collected all the presentations from this conference (and previous conferences). They are available here, but with restricted access. Some contain sensitive information, and only IBA members can read them. You want to become a member and access the whole information? Click here! At the end of the morning session, we came to know about the winners of the 2nd International blackcurrant products competition. The jury of the competition has been very impressed by the range of innovative products presented. 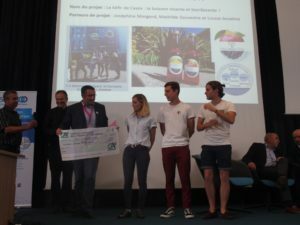 Several students from the ESA have worked on the creation of new blackcurrant based products. The result was exciting! In the afternoon, the IBA held its General Meeting (minutes available here) where Jens Pedersen took over the role of President of the IBA after Anthony Snell. 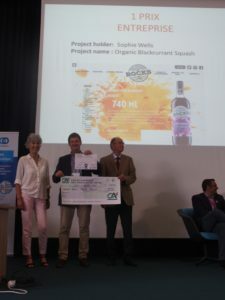 Upon individual choice, the conference ended either with a visit of Terra Botanica, the Giffard liqueur factory, or the meeting of the IBA Agronomy and Plant Breeding sector group. 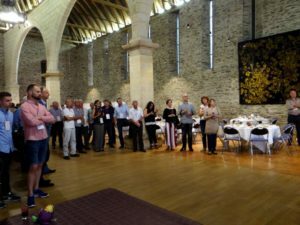 After reading this, you are certainly keen on joining us for the 7th International Blackcurrant Conference in 2020 in …? Well, we have not yet taken the decision of the date and place for the next IBA conference – but we will inform you by the end of the year!